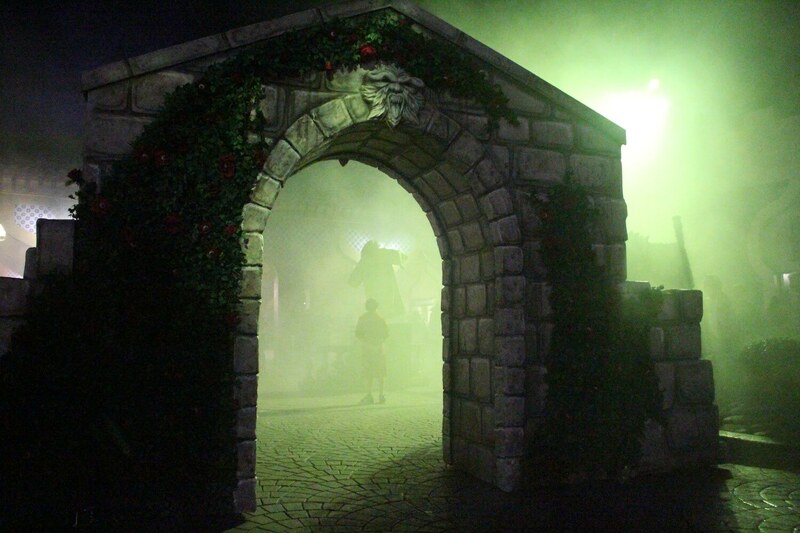 Halloween has consumed Busch Gardens Tampa Bay after sunset, turning the park into the Dark Side of the Gardens. This year’s theme replaces a long-standing tradition of having a single icon representing the event and in my experience of roaming the long, dark theme park paths on the event’s second night for 2011, the change is for the better. Without the burden of uniting the event’s scares with a single character, Busch Gardens this year offers a more kinetic, fun, and scare-filled atmosphere throughout its foggy streets and when coupled with three new haunted houses replacing tired old ones, Howl-O-Scream 2011 is one of the best versions this event has even been. Both Busch Gardens Williamsburg in Virginia and Busch Gardens Tampa Bay share the same overall theme this year, but each with its own take. In Tampa, the event features the somewhat oxymoronic tagline, “Zombies Live Here” (Do zombies really “live” anywhere?) that rings true throughout the night. 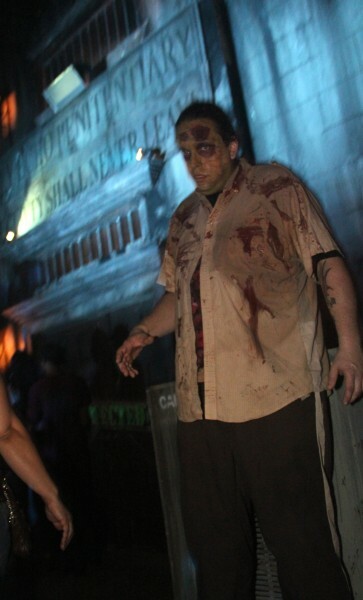 Guests encounter zombies almost everywhere, from in and around haunted houses to darkened pathways. 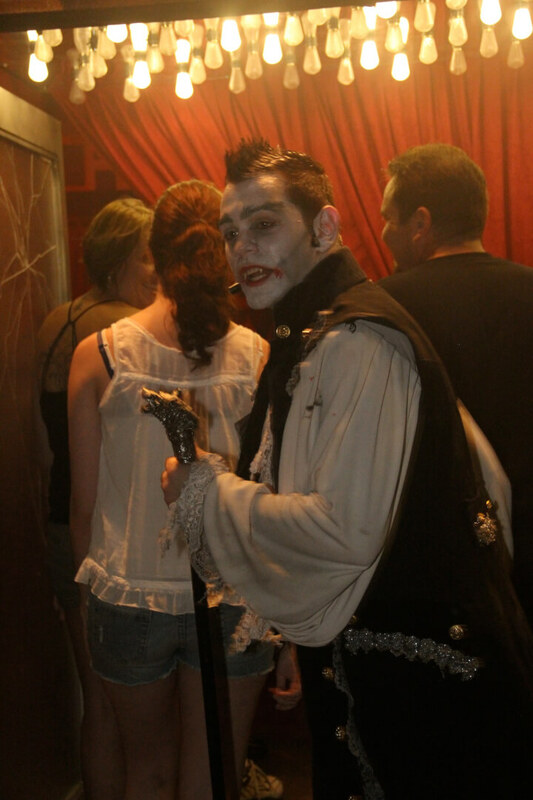 At times, there is seemingly no escape from the undead, with the experience beginning in the parking lot, continuing immediately inside the turnstiles, and lasting until the event is over. Take a peek inside the Dark Side of the Gardens in the overview video below, offering a glimpse at the many forms of zombies seen throughout Howl-O-Scream 2011, along with a peek at this year’s haunted houses and inside Club Virus (more on that below). 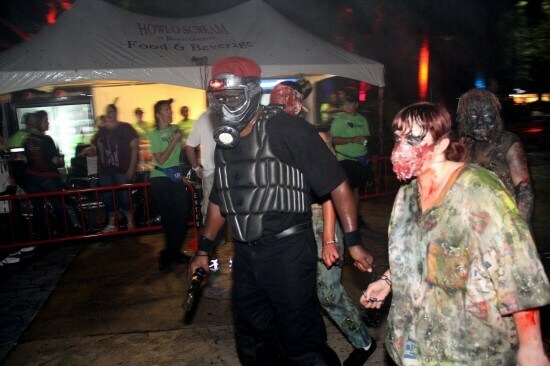 In an interesting twist on years of predictable Halloween event line-ups, Busch Gardens Tampa Bay made the decision to do away with specifically-named scare zones for Howl-O-Scream 2011. While this sounds disappointing at first, as the street zones always offer some of the event’s most entertaining sights, it’s actually one of the best decisions they have made in years. Rather than filling certain areas of the park with individual themes and characters, the entire park is packed with zombies of all kinds. 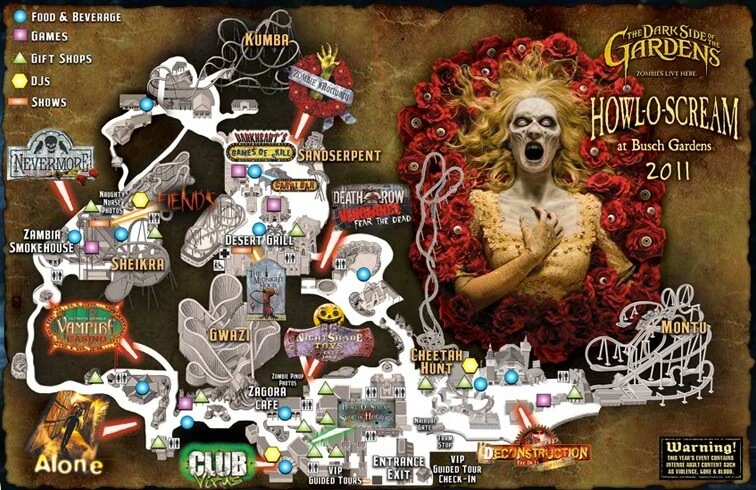 And without the zombie-infested areas clearly marked on the map, guests never know when they’ll encounter the next horde, but can be guaranteed it will be often. 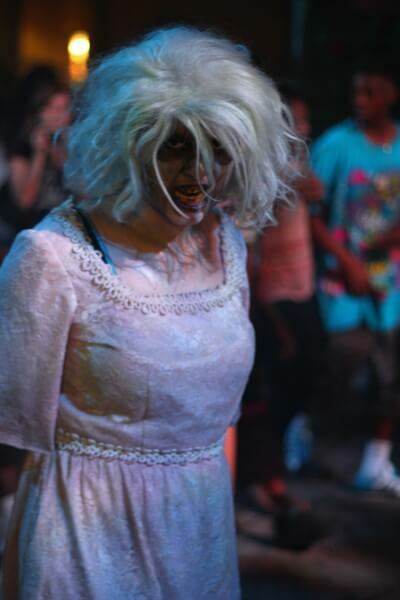 I’ve never seen more scareactors out “for blood” in the Howl-O-Scream streets than I did at this year’s event. 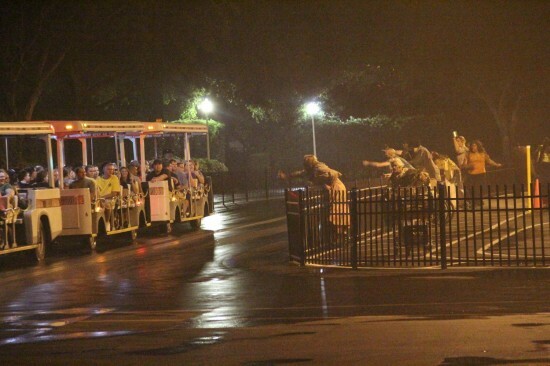 I knew something was different and special about the entertainment offerings this year when I was greeted by and growled at a horde of zombies as I approached the park entrance on the parking lot tram. Just behind the clawing undead group was a battered van, rocked back and forth by flesh-seeking zombies, with two victims trapped inside, honking the horn furiously to attract help. None came. This parking lot entertainment set the tone perfectly for the rest of the night, with the zombie fun continuing immediately inside the entrance as guests step foot into the Dark Side of the Gardens. Unlike past years that featured an entertaining but ultimately unsatisfying mini-show just inside the turnstiles, this year’s front-of-the-park offering places guests immediately in the scares, with a handful of zombies creating screams amidst the creepy garden theme. 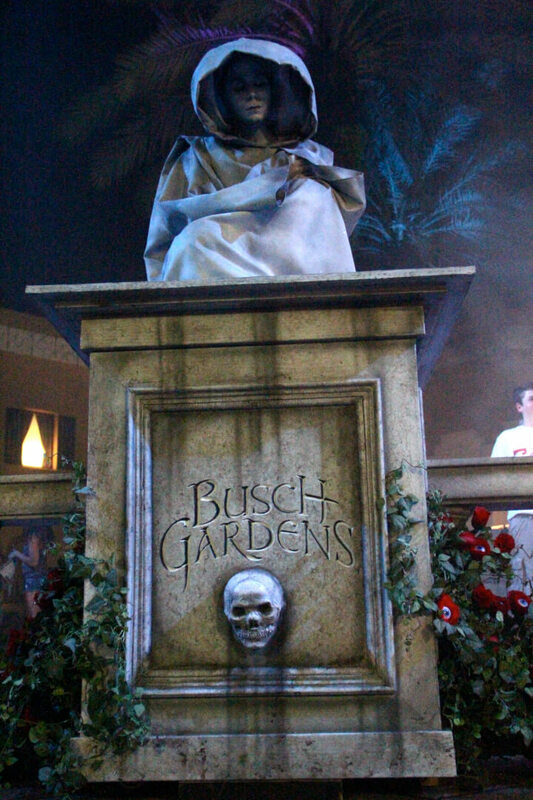 A living statue branded with “Busch Gardens” serves as a focal point, diverting guests’ attention from the undead swarming around them, all the while being watched by roses blooming with eyeballs, part of Howl-O-Scream 2011’s iconic imagery. Beyond the parking lot and entrance, the long paths of Busch Gardens felt quite a bit shorter this year while walking from haunted house to house due to all the street entertainment. I don’t think I walked more than a minute or two before encountering another zombie horde, each with its own take on the undead. 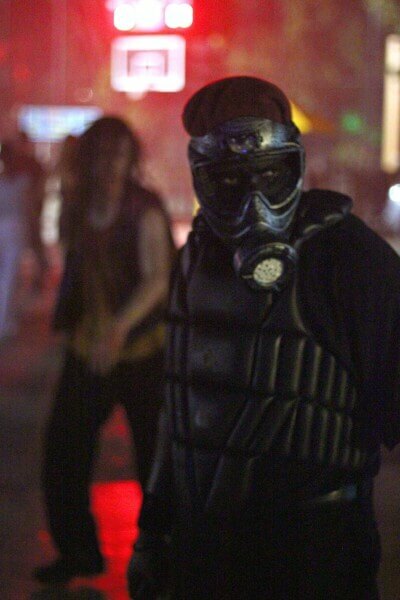 I saw clowns, bikers with chainsaws, a chain gang that broke free, zombie-fied Busch Gardens employees with unusual animals to show off, fanged creatures, werewolves, and the glow-in-the-dark Radioactive Occupation Transport team (aka R.O.T.). I wasn’t expecting any of them, so each was a surprise to stumble across – and I’m sure I didn’t even see all the creatures the park had lurking about. My only issue with not having defined scare zones is that without a particular expectation, some guests felt like characters were there for photo ops and meet-and-greets rather than to scare. I’m not sure if this should be blamed on the guests for being pushy with their cameras or on the scareactors for not doing everything they could to be menacing instead of friendly, but either way, the smiles and goofy photos always take away from the spooky atmosphere. 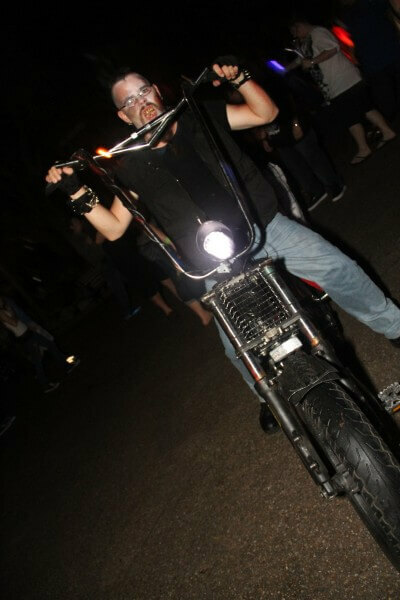 Plus, Howl-O-Scream always makes sure to have plenty of character photo opportunities available, with the forever-popular naughty nurses (both tightly-clothed girls and shirtless guys), shot girls, and, new this year, zombie pin-up girls. So while none of the zombies or other creatures were particularly impressive on their own, with costumes and make-up fairly simple (for the most part), as a whole, the surprise element works well for Howl-O-Scream 2011, differentiating itself from years past and from other Halloween events. 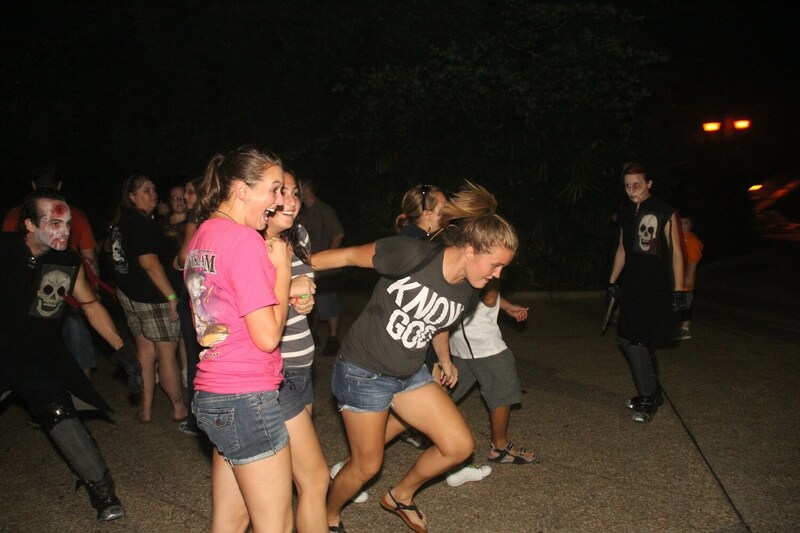 Without knowing where the scares will be next, guests passing through the park are stay on their toes at all times, just waiting and wondering if they’ll be the next victim. For 2011, Busch Gardens broke halfway free of the stale repetition of haunted mazes of the past. 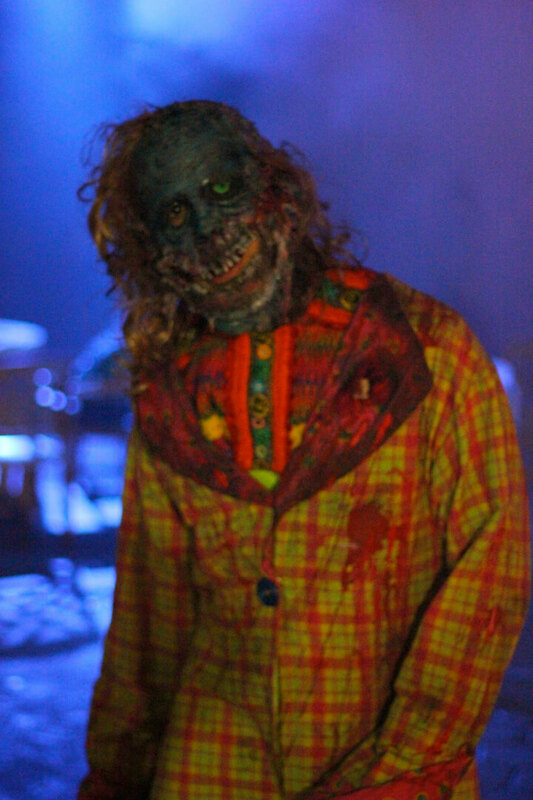 Three of the seven haunted houses this year are all-new and offer a noticeable improvement on their haunts of the past. Read on as I review and rank the experiences below. The zombie trend continues inside the new haunted house, Zombie Mortuary, set inside a funeral home. Lurking outside the entrance are a handful of slow-moving zombies, setting the stage for what’s to come inside. But once within, guests don’t find an expected a brain-hungry bunch lunging at them with arms outstretched. 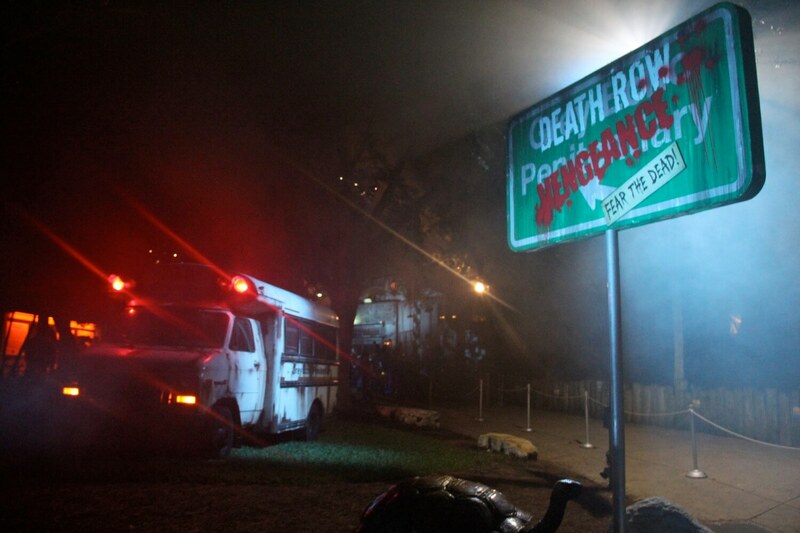 Instead, Zombie Mortuary offers a series of scenes that take visitors deeper and deeper into the subject of death. Beginning inside a funeral home with somber organ music playing, this house starts with an aura of foreboding, a phrase I lift directly from Disney’s Haunted Mansion on purpose as stepping into this maze gave me a similar feeling to walking into the foyer of that classic dark ride. 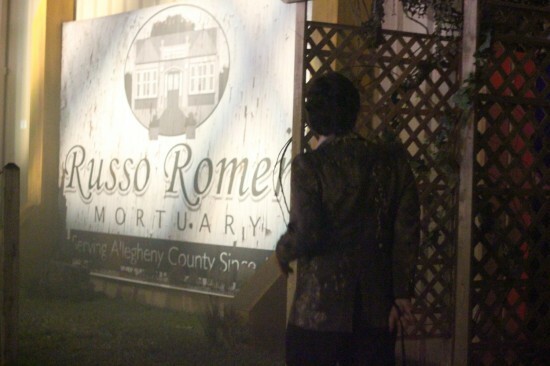 But Zombie Mortuary certainly is not a family-friendly dark ride, as the path takes those who dare proceed into the backside of the funeral industry, including too-close-for-comfort glimpses at cremation and a cemetery burial. 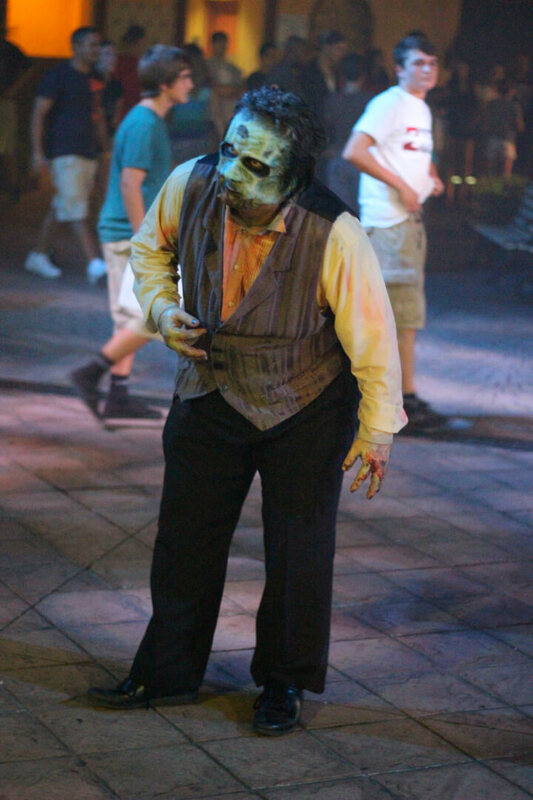 Many of the scares are typical Howl-O-Scream, with a lot of ghouls popping out from dark areas or behind walls, screaming a quick word or phrase for a startle. But more involved scare techniques of misdirection and some special effects are also present in this house, though some of the effects are a bit too “off the shelf.” Despite any of these downfalls, the experience of walking through Zombie Mortuary is unlike any other maze at Howl-O-Scream and of all the houses this year, it’s the one I wanted to revisit the most. With twinkling lights and a live barker beckoning the living to enter, the Vampire Casino is in full Las Vegas swing from the outside in. This new house for 2011, while entertaining, never completely embodies its name. It’s surely a casino, but like with Howl-O-Scream’s now-retired vampire house Taste of Blood, I never got the feeling that vampires were behind the madness that unfolds inside. The clearly Las Vegas-inspired rooms, featuring slot machines and even an Elvis wedding, offer some memorable images but ultimately devolve into hallways of startle-scares that are relatively indistinguishable from any other house at the event. I remember is hearing the pre-recorded line, “Save yourself!”, repeated on endless loop every 10 seconds or so, making me want to do just that. And yet I did leave the house entertained, though definitely not scared. Vampire Casino has great potential for the future, with the first half far more memorable than the conclusion. With more unique scenes added to the end, this maze could turn into a favorite in coming years (if it returns). The comparisons between the Edgar Allan Poe-inspired haunted house at Howl-O-Scream and the similarly-named one at Universal Orlando’s Halloween Horror Nights are unavoidable here. And unfortunately for Busch Gardens, Universal’s higher-budget, higher-concept, higher-detail house is my favorite of the year, leaving Howl-O-Scream’s Nevermore with a lot to live up to. And as a fan of Poe, I felt like Universal treated the writer’s works with respect, offering a tasteful tribute to the famous poems and stories, bringing to life many well-described settings and characters while still including additional scares. 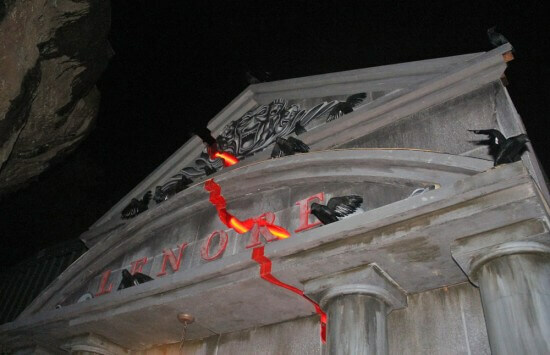 Busch Gardens went in a very different direction with their Nevermore house, taking the basics of Poe’s works and running with them in twenty different directions. The experience doesn’t start on the right foot, with a silly-looking skeleton bathed in green light placed outside reciting lines from, “The Raven.” Instead of taking Poe seriously, from that moment guests feel like this house is likely to be a running joke. Coupled with another barker standing high above the maze’s entrance uttering largely unintelligible things (Is he supposed to be Poe? Not sure. ), the mood is not properly set for entering the mind of Edgar Allan Poe. The always-effective startles scares are present throughout almost every room, with little atmosphere or ambience created to represent Poe’s suspenseful writings. The first half of the maze often feels comical rather than creepy, with talking busts and cartoonish Poe portraits. A scene representing “The Cask of Amontillado” is one of the few that actually feels like the original Poe story, which is also notably absent from Universal’s maze, so I was happy to see it featured. But upon approaching “The Black Cat” section of Howl-O-Scream’s house, any sense of danger is lost upon seeing extraordinarily fake-looking cats with bright green eyes, followed by a giant cat’s eye projection that literally said “DVD REPEAT” on it. This whole section felt sloppy. 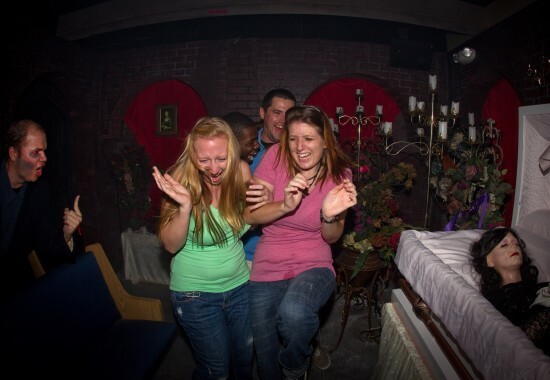 Fortunately the Nevermore house ends with its best scenes, first forcing guests to travel in pitch darkness through a tight squeeze before thrusting them into a red and white strobing room representing “The Masque of the Red Death.” From, the scares come more frequently and efficiently, with every visitor sufficiently disoriented. But in the end, few of Poe’s eloquently-written descriptions of horror, death, and despair come across in this largely confusing take on his works. I revisited Nightshade Toys and Death Row Vengeance, both of which featured minor updates to characters and some decor. Both still stand out as entertaining houses that I welcome back each year. Nightshade was my favorite house when it was introduce a couple years ago and I’m happy to still see it around, particularly with more exterior props and a few more actors added. The zombies added outside Death Row Vengeance helped tie it in with the rest of the event, though despite the word “INFECTED” now spray painted in bright green throughout the house, I never felt like the zombie outbreak had really penetrated this prison. Nevertheless, it’s still entertaining. I did not have a chance to revisit Deconstruction this year, but from what I’ve been told, it’s largely the same (if not worse) than last year’s version of the maze. I suspect this will be the next haunted house to disappear from Howl-O-Scream’s line-up, along with the DED sorority house and Trapped in the Walls, which both vanished this year (thankfully). Finally, the personal experience in horror called Alone returned this year at a higher price and without offering a free T-shirt to those who make it through by themselves. Having heard that the house was essentially the same as last year with a new twist ending, I opted to skip it. I thought the experience of walking through last year was worth enjoying once, not knowing what was in store for me, but without major changes and surprises, I don’t see a reason to return – particularly for the high $40 price. In all, the haunted houses of Howl-O-Scream 2011 are a mixed bag of success and confusion, but with hope for the future as old houses are retired in favor of new experiences that will (hopefully) get better in the coming years. 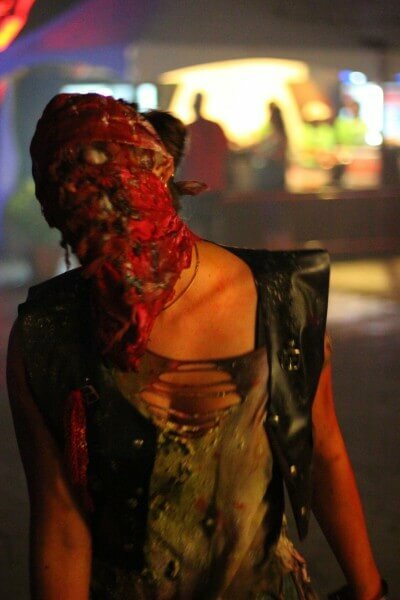 But for my time there, I found the zombies in the streets to be far more entertaining than the mazes themselves. 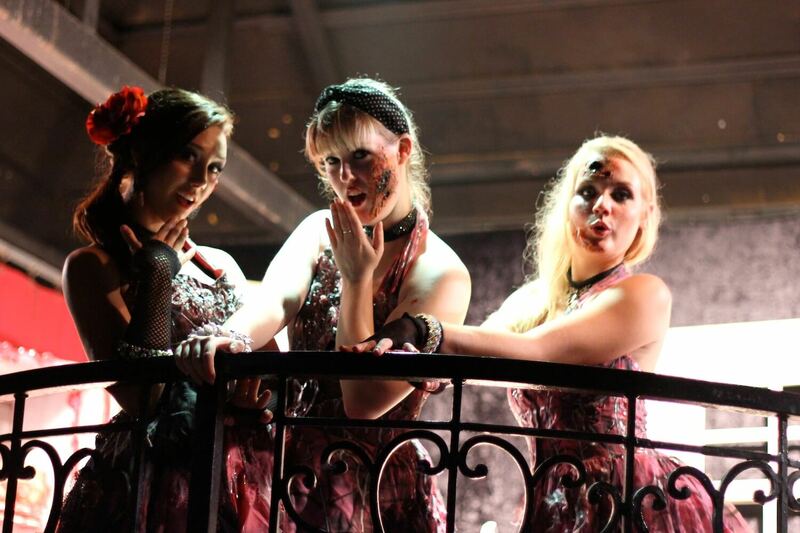 Howl-O-Scream continues to define itself as a fun, party-filled night. 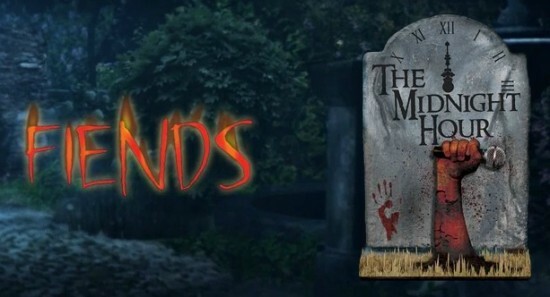 In addition to quick scares and amusing moments in the streets and haunted mazes, Fiends returns once again, offering plenty of naughty nurses and wacky Halloween-inspired dance numbers. Despite largely being the same show year after year, it still draws a crowd. New this year is The Midnight Hour on the Timbuktu stage. It follows in the new tradition started by last year’s strongly entertaining Blood Relations show, selecting a handful of celebrities to poke fun at. Because of long haunted house lines, I didn’t have a chance to see The Midnight Hour in person, but after watching the full show on YouTube, I don’t believe it was quite up to par with last year’s performance. Some of the one-liners were laugh-out-loud good, but the song selection was poor and the overall premise was far less Halloween-themed than I would like out of a Howl-O-Scream stage show. The Howl-O-Scream nightclub returns once again this year in the form of Club Virus. For those 18 and older, there’s no cover charge to enter. After a quick ID check, those inside can enjoy a DJ playing loud beats, accompanied by no shortage of attractive young female dancers on stage and on the floor. Plenty of drinks are available for this club that seems to have found its place in the event, offering a getaway from the screams for those who simply want to socialize. It’s not for me personally, but I can see where many will enjoy their time inside this convenient hangout. Eat before you scream. I’ve never found any of the food available during this event to be good, particularly not the offerings available during the Timbuktu stage show – this year, The Midnight Hour. Plan your path. Busch Gardens is a huge theme park with long, winding dark pathways that you’ll regret traveling down twice. 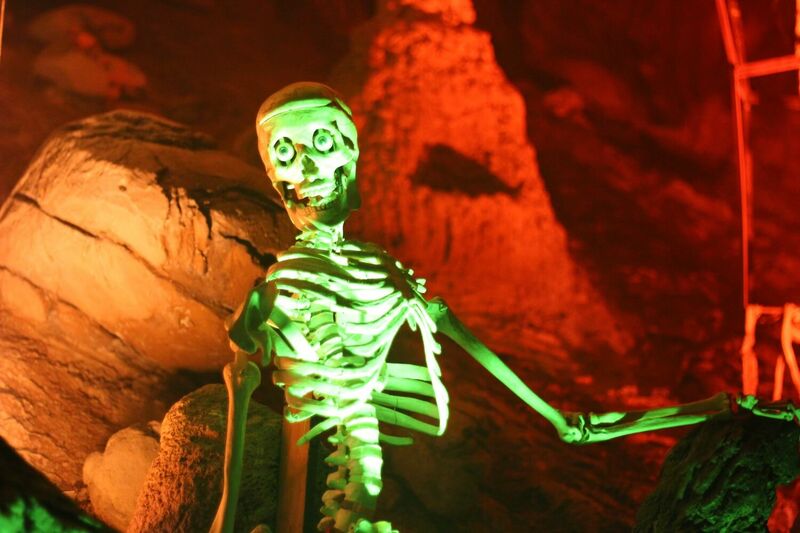 Try to hit all of the attractions (haunted or otherwise) in each area of the park, avoiding return trips. Don’t miss the unique merchandise in the Shop of Horrors near the front of the park, particularly the rose/eyeball lenticular pin that looks around as you move it. If you want to experience Alone, buy your ticket in advance. It’s likely to sell out before you get there. Take the time to explore the park’s streets during the event, as you’ll never know what zombie hordes you’ll come in contact with next – and they’re the most entertaining part of the night. 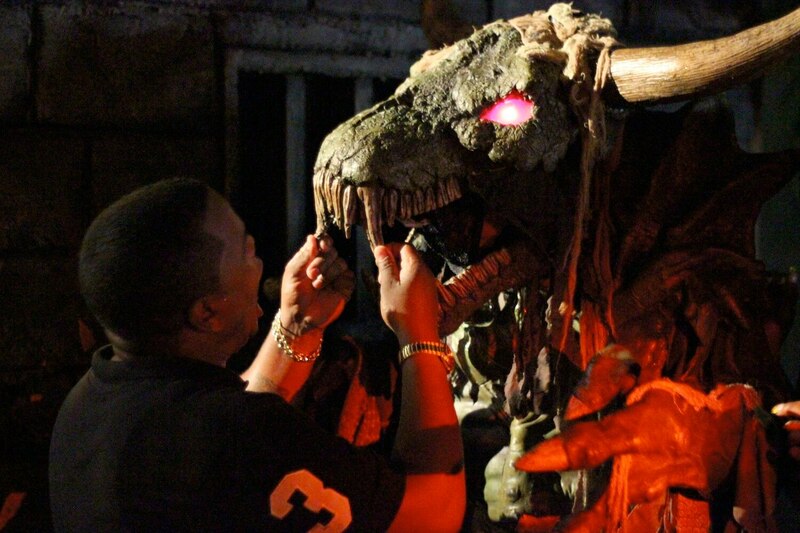 Visit Howl-O-Scream.com/Tampa for more information and to buy tickets. 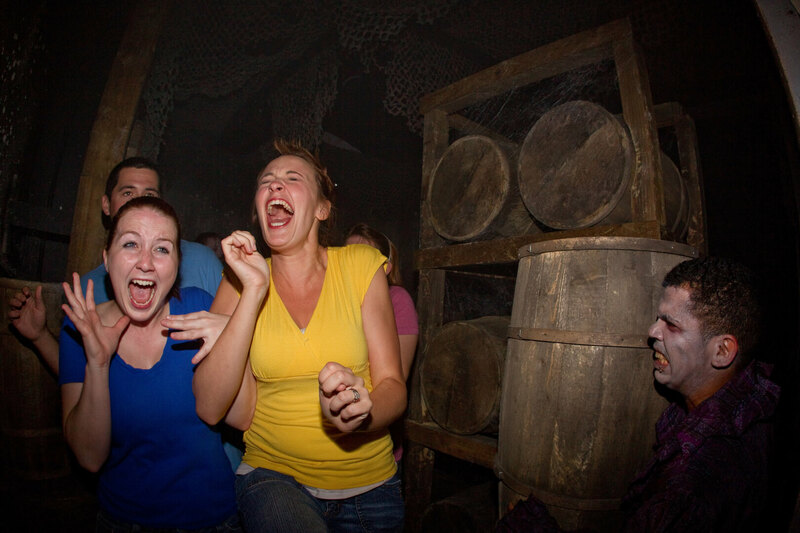 The main problem with Howl O Scream this year was that it was oversold. I live 30 minutes from the park, however, the trip took over an hour and a half because there were so many cars waiting to get into the parking area. Once we were finally able to park it was actually at Adventure Island’s parking lot! The wait for the tram was over an hour so we decided to walk. The lighting was poor and traffic was so bad that the walk was dangerous and took up a good 20 minutes more of our time. When we finally entered the park the line for each attraction was a minimum of 2 hours. We only had time to go through 2 haunted houses and nothing else. And we still did not leave the park until after the 1AM closing time. I am an annual pass holder and this is the fourth year in a row that I have gone to Howl O Scream and this is the first time that I have been disappointed. I would suggest that Busch Gardens only sell a limited number of tickets for this event so that all guests can enjoy it. They do sell front line passes but they are $75 and when they let these pass holders go to the front of the line they are only making the wait that much longer for everyone else. 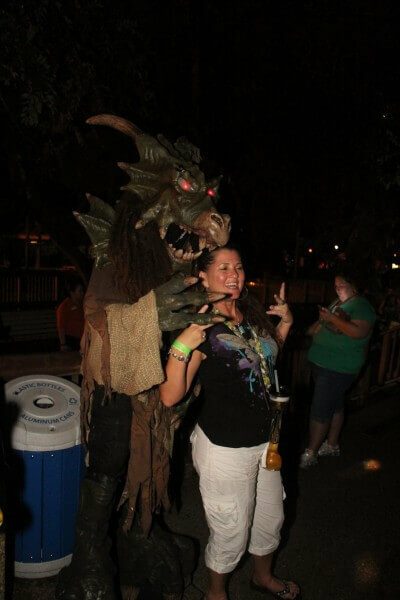 If Busch Gardens does nothing to rectify these issues I will not return for Howl O Scream and I will recommend to everyone I know that they not go either…. 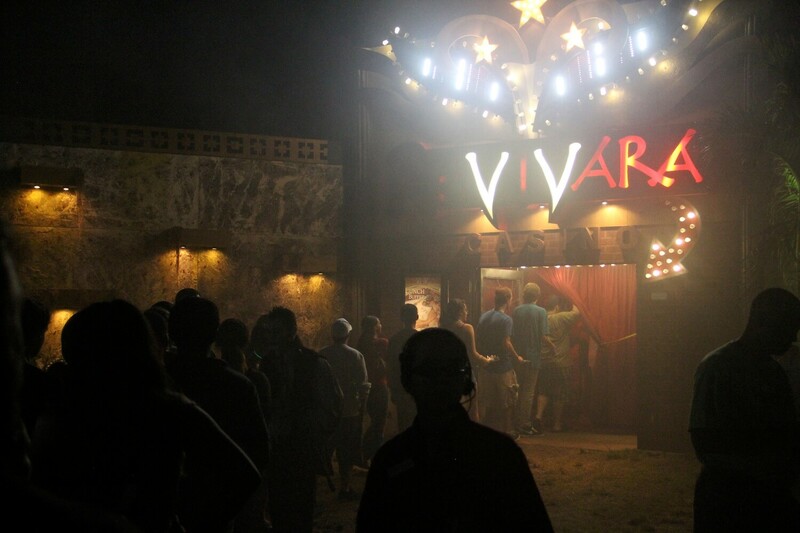 I attended one night at Howl-O-Scream and definitely found it to be more crowded than I’d ever seen the event before. It seems to be a victim of its own success, much in the way Halloween Horror Nights is on its busiest nights. But Horror Nights has made up for long lines by offering more nights and more houses to choose from. The 3 new houses at Howl-O-Scream are the ones most people are going to flock to, creating extremely long lines for those experiences. There will always be nights were lines are longer than others, but it is certainly possible to oversell this event, particularly in the number of front-of-the-line passes sold. This year was my first time going to Howl~o~Scream. I agree with a lot of patrons that I got to speaking with that it was PACKED! I had no choice but to get the fast pass, if not, I would have not been able to see and do all. 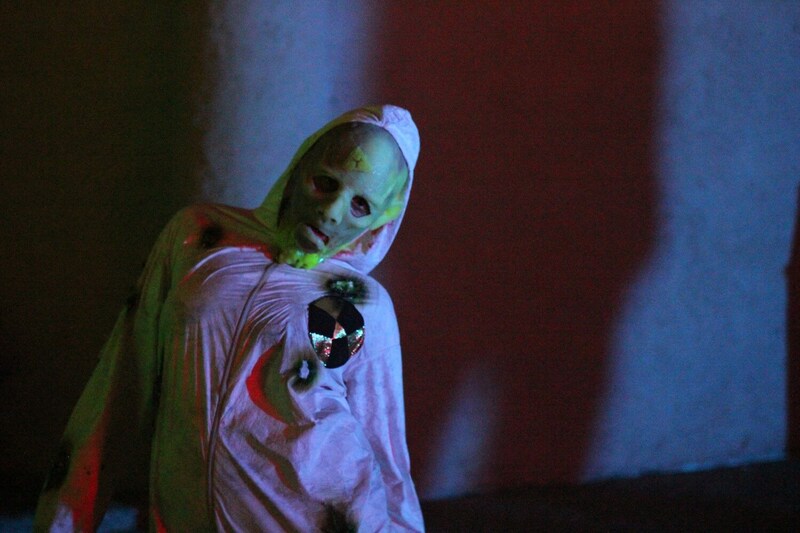 $35 fast passes for just haunted houses or $50 for both haunted houses and rides. I did the $50 pass. Now, it’s not unlimited; you get one time to pass the lines to each of the houses and select rides. The rides that were open: Kumba, Cheetah, Qwazi, Montu and Sheekra. Two of the five rides where down the night I went. Yeah. 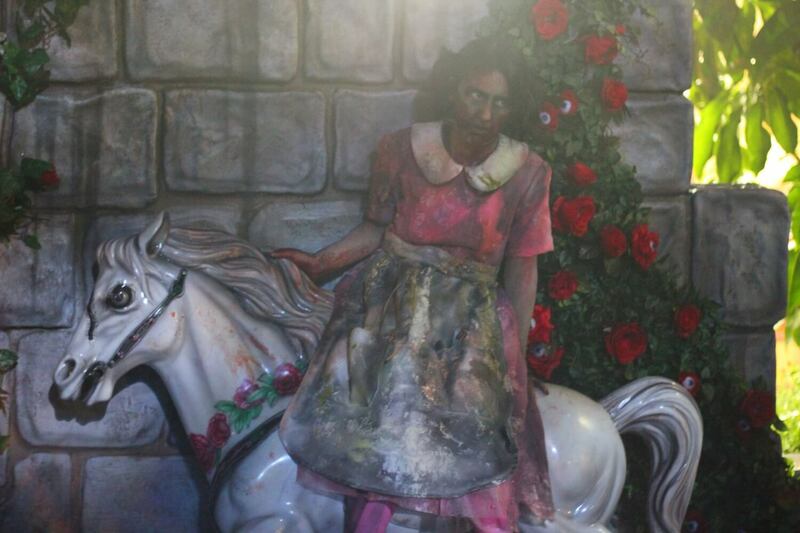 The haunted houses were nicely decorated, cool themes and very spooky looking; however, shuffling in a long crowded line really takes away from the experience. You just cannot get scared if you know what’s coming to you. Yeah. I have very mixed feelings about Howl~o~Scream. If Busch Gardens can cut back on the number of people they let in the park that would be great. The employees did a really good job at acting like zombies and trying to scare you as you tried to find your way to all the rides. Parking was easy since I invested (again) into the extras. I decided to bypass all the waiting and just went straight to preferred parking and since I bought the $50 pass I got a small discount on food and merchandise. Yayyy! (sarcasm in my voice). So… If you are willing to dish out more money on preferred parking and a fast past you should be good to go. If not, I guarantee you, you’ll be miserable and you will never see all the haunted houses. to post a thought 🙂 I actually do have a few questions for you if it’s okay. Could it be just me or do some of these remarks appear like coming from brain dead individuals? 😛 And, if you are posting at other places, I would like to keep up with you. Could you list every one of your communal sites like your twitter feed, Facebook page or linkedin profile?